MeetingKing is an extremely powerful task management application. You can manage all your meeting tasks, but also all other tasks. 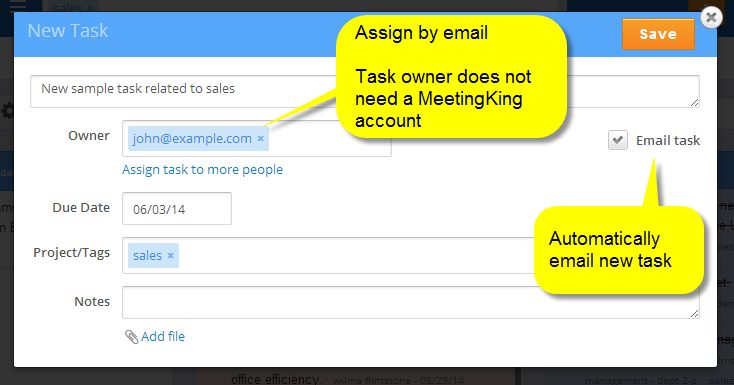 You can even create and manage tasks via email! You can view all your tasks, the tasks you assigned and tasks you follow on the Tasks page and in the Calendar View. With a simple click you can filter tasks, by task owner, project, department or tag, or any combination of those. You can create a stand alone task from anywhere in the application by clicking the New task link under the orange button in the main navigation bar. 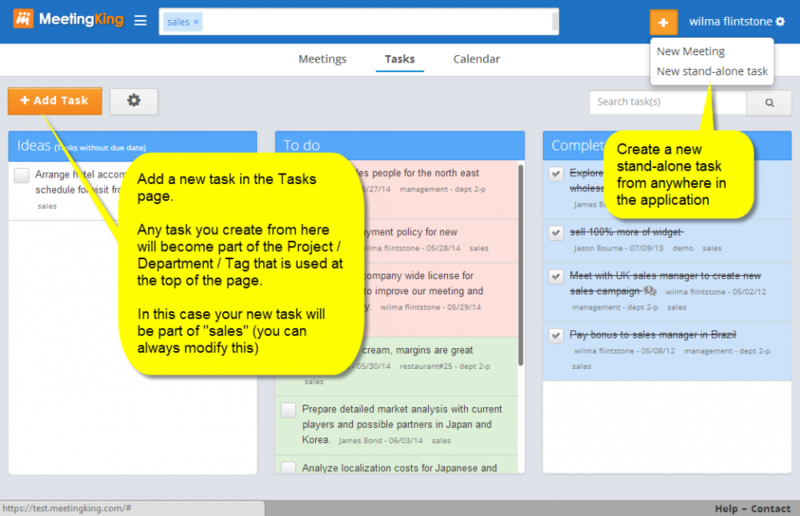 You can also create a new task through the New task button on the tasks page. The great thing there is that if you are viewing a project or department, your new task with automatically get those tags and be added to that project and/or department! You can assign a task to anybody by simply using his or her email address. The person does not need a MeetingKing account. I you select to email the task owner a message with the new task that person can even mark the task complete and add comments via email. If you have tens or hundreds of tasks you may want to see only those tasks that are relevant to a certain project, department of person. MeetingKing makes that really easy. In the task page or in the calendar view simply click on Project / Department / Tag or the task owners name under a task and you will only see those tasks that are part of that Project / Department / Tag or owned by that person. Read more on managing by Project, Department and Tag.